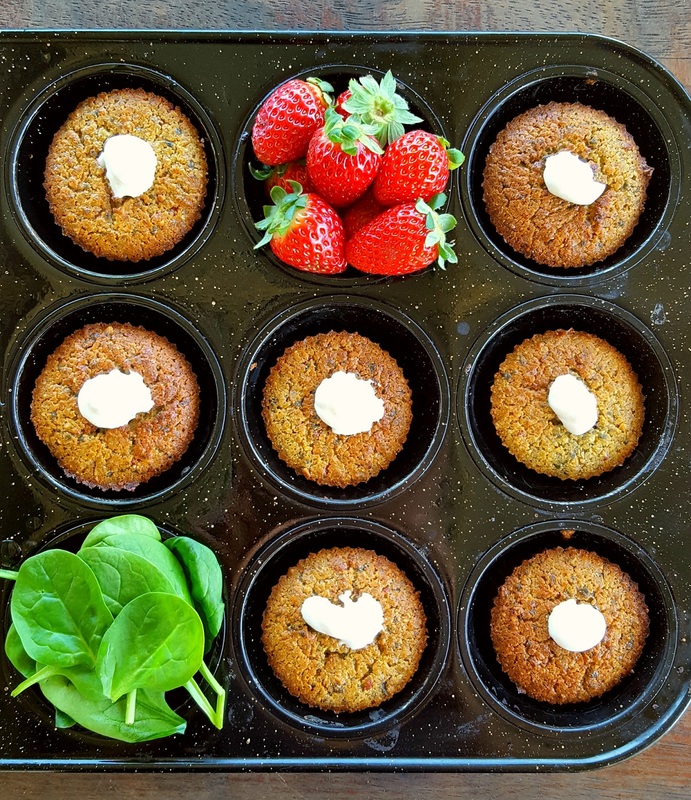 Inspired by the delicious, nutrient-rich, winter produce & one of our favourite easy-prep salads, the Strawberry, Cream & Spinach Muffins were created as a tasty, healthy snack to enjoy anywhere, anytime of day. They’re not overly – sweet, and not savoury, but lie perfectly in between. 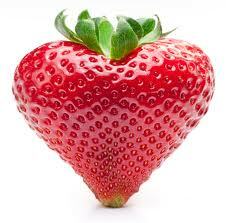 Using minimal ingredients & have been taste- tested by children (aged 1+) & adults who’ve loved them. 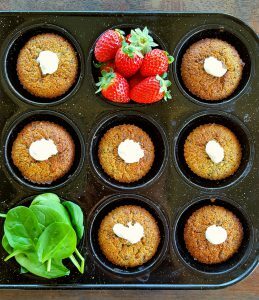 The recipe is flexible & can cater for many diets, such as Gluten Free, Nut Free, Dairy Free Paleo & LCHF. We’ve served them for morning & afternoon tea, packed them in the school & childcare lunchboxes & ran out with them in hand or in the handbag. A large handful of Strawberries supplies close to 100% of the RDI of Vitamin C for adults, assisting with strengthened immunity & collagen production, and combining Strawberries rich in Vit C with a non-haem iron source, Baby Spinach, assists with the all important iron absorption. Preheat your fan-forced oven to 190C (375F) and prepare a muffin tray by greasing or lining the holes. In a food processor, add the Quinoa & Oats and pulse until the texture is fine & crumbly. Next add in the Baby Spinach, Strawberries & Baking Soda, pulsing until they’re combined with the crumbs. Then add in the Eggs, Oil, Honey/RMS & Vanilla and mix well with the rest. Once the mixture is well combine, it should be moist but not runny, spoon into your muffin tin, filling each hole approx. 3/4 full..
Bake for approx. 30-35 minutes (depending on your oven) and remove them when the muffins have cooked through completely. Stand them to cool for a couple minutes on a cooling rack before serving or storing. I’d love to know your thoughts about this recipe if you’d tried it.